As a teenager in the age of AIDS, the very notion of such an esoteric disease was both personal and scary. When I left home for college, I applied a fairly rigid set of standards to my own behavior to avoid becoming HIV+. That’s how AIDS affected me. In my early 20’s, I became the director of an Extended Day Program. I was much younger than the rest of the directors, ran a financially beleaguered program, and was new. So popular, I couldn’t stand it! Delightful L ran a similar program and was marginalized for other reasons. He became a good friend and great source of comfort in that difficult first year. I knew he was ill, but couldn’t believe it when a few months after leaving his job, he died of AIDS. His diagnosis was kept secret from everyone, including friends, and his adoring grandmother insisted that only pneumonia be listed as his cause of death. I, like everyone, knew that a larger-scale tragedy had taken place. That’s how AIDS affected me. In my early 30’s, our up-and-coming neighborhood in Chicago housed a program for those living with AIDS. I donated a few meals, some toiletries and cash, and would wince with guilt knowing I could do more, but didn’t as I sauntered past to my own healthy life. That’s how AIDS affected me. In my late 30’s I prepared to adopt from Ethiopia. Initially terrified that I might bring home an HIV+ baby, I was comforted by the thought of numerous tests designed to assure us and a worried US government that our little one would be healthy. AIDS could remain confined to Africa, with no residue clinging to my own life. That’s how AIDS affected me. In my early 40’s, I took a second trip to Ethiopia. I met hundreds of children whose eyes were haunted with loss, and felt my heart break in two when a girl at Children’s Heaven shared her personal narrative. After her mother died, she and her sister lived alone and eventually sold their spoons as a means to pay for food. Contemplating a world of orphaned children with no resources keeps me awake at night. That’s how AIDS affects me. *I’ll be making an additional contribution to Children’s Heaven this month. 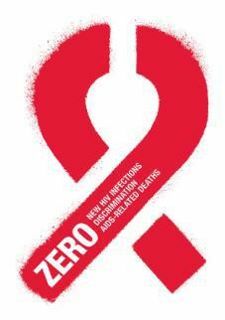 I’ll contribute an additional 1.23(1.00, for each one of you, 23–the number of years World AIDS Day has been commemorated) on behalf of each person who leaves a comment on this post. Thank you for doing your part.